As VPNs are becoming more popular, more and more service providers keep popping up. And while competition might be good for the free market, the saturation of the VPN world can be intimidating. A quick google search for “VPN providers for Mac” brings up more than 18 million web pages making finding the Best VPN for Mac incredibly difficult. Instead of having you waste away while sifting through the results, we’ve compiled a list of what are widely considered to be some of the best VPN offerings out there. Before we begin, I just want to note that I tested the following applications on Mac OS X El Capitan. With that out of the way, let’s begin with one of my personal favourites – IPVanish. If you’ve done at least a little bit of research into VPN and top providers, then it’s likely that you’ve stumbled upon IPVanish and their offering. There is a reason for why IPVanish is so popular amongst VPN users – their service is both reasonably priced and reliable. Taking a look at the Mac OS app you’ll notice the intuitive interface, and you shouldn’t have any trouble setting it up – even if you’re a complete beginner. 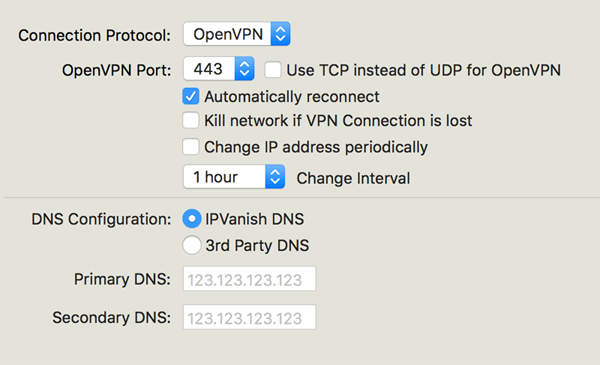 Like most other VPN providers, IPVanish offers a quick “one-click” solution, that allows you to connect to the fastest server. If you’re looking to select a more geographically specific server location, that’s not hard to do, either. More experienced users can switch between a number of connection protocols, and even play around with DNS configuration. Currently, IPVanish spans over 40,000+ IPs on over 400 servers, in over 60 countries, and they’re still growing. And it’s because of this vast network, IPVanish can offer some of the fastest VPN speeds on the market. 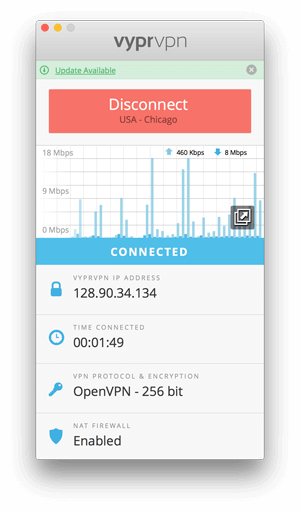 StrongVPN is the choice for minimalists – or people that don’t want to do much configuration. When you first launch Strong, you’ll notice a big blue button that will allow you to quickly secure your connection. You can also select a specific server, simply click the globe icon next to the “Connect” button and you’ll be greeted with a complete list of Strong servers. Although there aren’t as many options as you get with IPVanish and other competitors, there are more than enough locations to choose from. Once you’re connected to a server, you can simply close the window and the client will continue running in the background – which is frankly my favourite feature. 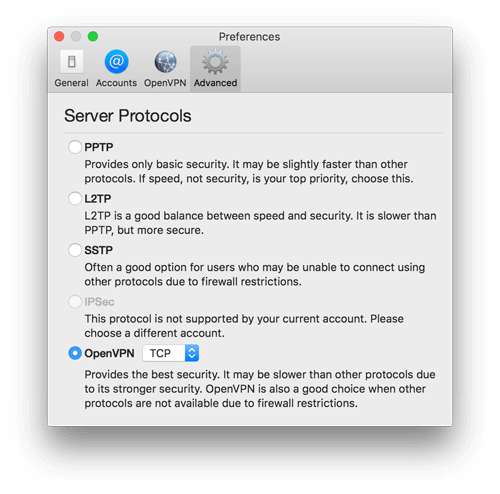 Similarly to what you’d find in the “advanced” panel of IPVanish, Strong allows users to choose between PPTP, L2TP, SSTP, and OpenVPN. If you don’t know what that means, it’s best you leave it on its default setting. 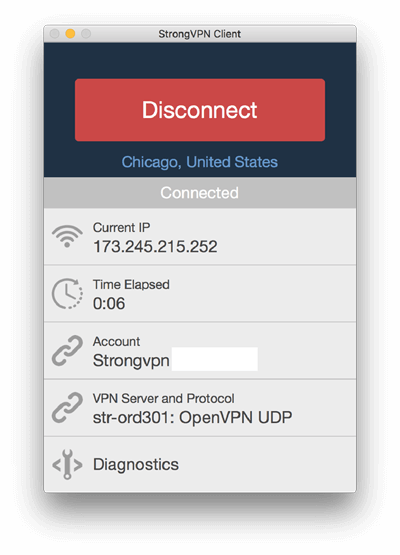 As far as limitations go, StrongVPN is fairly basic in terms of configuration. That being said, if you’re new to the VPN world, or if you’re just looking for an easy cross-platform solution, Strong is definitely up for the task. If you’re looking for a lightweight, but customizable, cross-platform VPN, then ExpressVPN might appeal to you. 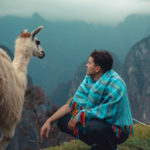 Like the majority of other clients listed here, ExpressVPN allows inexperienced users or those that just want to get online, to quickly connect to the fastest available server. For more advanced users, there are a number of preferences to consider under the hood. Here you can switch between connection protocols and customize some of the application settings. Personally, I have mine set to launch on start up – that way I don’t have to do a thing when I turn on my computer. 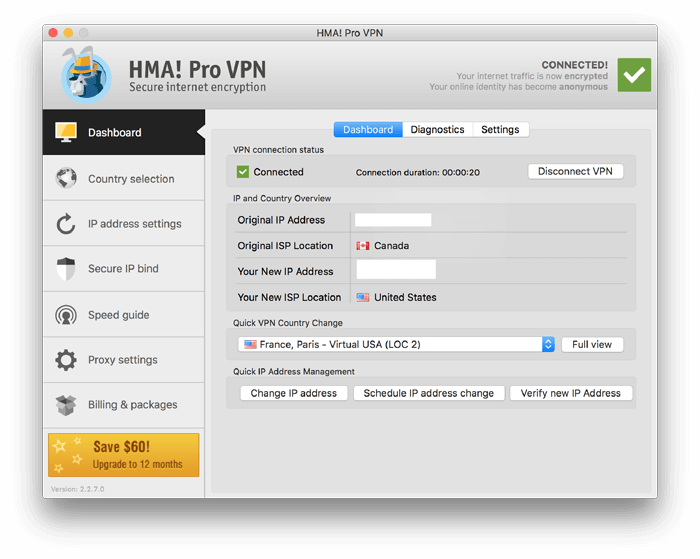 A simple feature, but not every VPN provider seems to offer it. 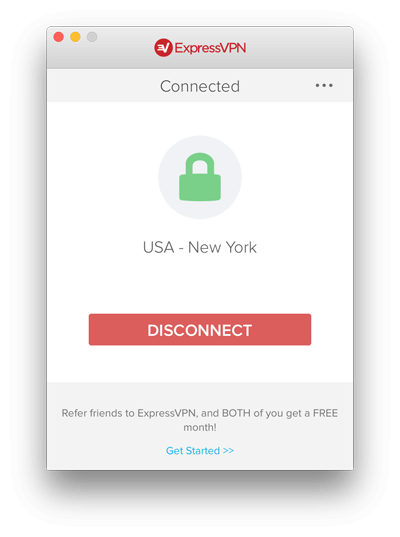 In my testing of these VPN clients, ExpressVPN was consistently offering some of the fastest download speeds, but not without a cost – literally. As far as pricing goes, ExpressVPN is a little bit more pricey than the majority of other VPN clients offering a similar service. A single month of ExpressVPN will run you just under $13 unless you choose to jump on board for a whole year, in which case, expect to spend about $8.32 monthly. VyprVPN used to be my default VPN provider for about 6 months. Their offering is similar to other providers listed here, but they have a slight advantage when it comes to network management. Everything from software design to the hardware and the DNS is managed in-house, meaning that Vypr is likely one of the most secure solutions out there. Looking at the app itself, you’ll see a minimal footprint window, that will greet you with that infamous “Connect” button, which will simply link you up with the fastest server. Similarly to the rest of the providers mentioned here you can select a more specific geographic location, and adjust the connection protocols to your liking. Unlike the other providers, VyprVPN offers a visual representation of their network speeds via a real-time graph. As I mentioned, VyprVPN is a top-tier solution, but I personally stopped using the service due to the limited download speeds. Despite spanning more than 200,000 IPs on 700+ servers, VyprVPN always seemed to lag behind its competitors. The HideMyAss Mac OS application is incredibly customizable, which unfortunately comes at a cost. The app itself is rather bloated, and if you’re trying to find something for the first time, it might take a while. That being said, let’s take a look at some of the configurations. After connecting to the desired server, you’ll see your connection information displayed under the “Dashboard” tab. Here you can also switch between servers, and diagnose your connection. Another interesting feature that HMA! offers that other providers seem to overlook is the ability to reassign the IP address every X minutes. The rest of the tabs house configurations similar to what was mentioned with other service providers. The only other difference that I could spot is the ability to configure a proxy. Users can choose between connecting directly to the internet, HTTPS, or SOCKS. HMA! Is a decent service, and ignoring the heavily layered app I only have one gripe with the service. It seems that regardless of the server I choose, I can’t get the download speeds to match any of the competitors, and in some cases it doesn’t even come close. Whilst it’s certainly not the Best VPN for Mac, some of the features may make them the solution for you. Listed above are some of the best VPN solutions available for Mac OS, and as you can see – these providers are quite competitive. There is a lot of overlap when it comes to features, so at the end of the day it really doesn’t matter which provider you go with. It all boils down to preference, so do some soul searching and get ready to experience a more private internet. 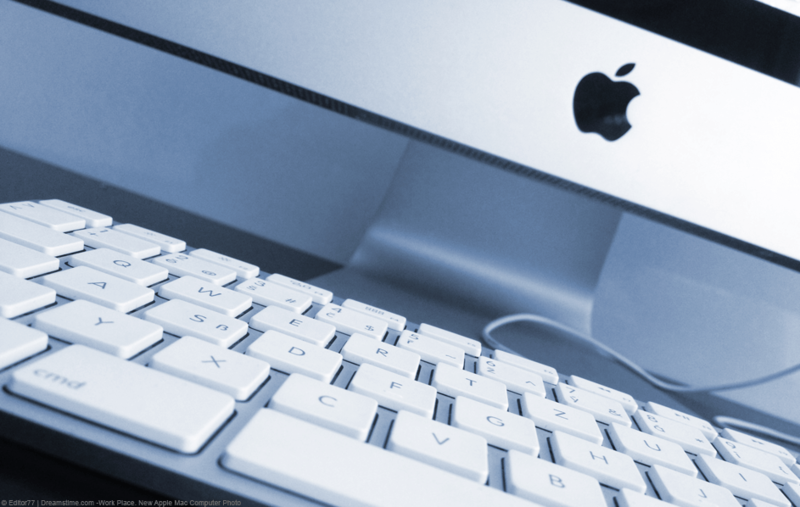 If you want to recap what the Best VPN for Mac is then take a look at our table.